Welsh gold has been used for the making of jewellery for many years dating back as far as 75 AD. The range of jewellery styles welsh gold is now found in depends on the jewellers, just like any other. Several are held in Wales still producing Welsh gold jewellery from a stock pile held over from the closed mines. The style of jewellery keeps with the times and changes year on year with the larger companies such as Clogau producing several new ranges a year. The production is identical to that of Links of London and other large jewellery manufactures, yet Welsh jewellery companies hold a unique hallmark confirming that the jewellery item contains rare Welsh gold. Gold at the St. David’s Gold Mine was first discovered nearly 170 years ago in 1847. Since then, it has remained some of the most sought after gold in the world. Situated in one of the most stunning areas of Wales, the Clogau mine is now closed, but the tradition lives on through Clogau’s stunning jewellery and watch designs, all of which contain a touch of rare Clogau Welsh gold. Clogau is a second-generation family business based in North Wales with over 20 years experience in creating handcrafted jewellery of the highest quality, beauty and originality. Creating Clogau jewellery is not just a skill. It is an art. Many hours are spent designing their jewellery, perfecting every last detail. Their craftsmen hand make each piece – accurate to the finest detail. Clogau employs its own jewellery designers to fashion this rarest of precious metals into exclusive collections. The designers take much of their inspiration from the themes and traditions found in the Welsh landscape and culture. The circles and swirls of eddies in rock pools, the intertwining flowers and patterns of Celtic art are all found in Clogau’s intricately crafted pieces. The love and dedication that our craftsmen show for their work is reflected in every piece of Clogau Gold jewellery. The Clogau Gold Mine, situated in one of the most stunning parts of Wales, amongst the hills and mountains of Snowdonia, is famous for supplying the gold used in some of the wedding rings worn by the Royal Family. The gold that was used to make the wedding rings of Her Majesty The Queen, His Royal Highness The Prince of Wales, the late Diana Princess of Wales, Her Majesty Queen Elizabeth The Queen Mother and Her Royal Highness Princess Margaret all came from the famous Clogau St. David’s Gold Mine. 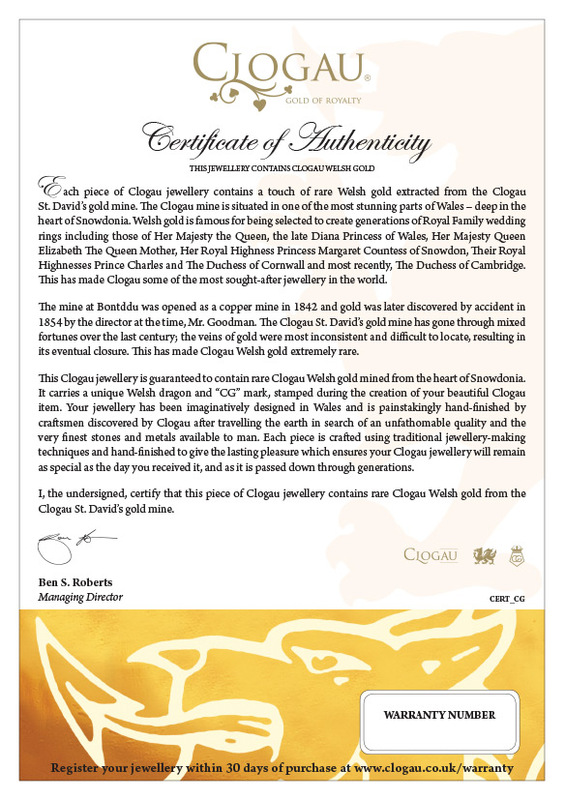 Every piece of Clogau includes a bilingual Certificate of Authenticy to certify the content of Welsh gold. Each piece of Clogau jewellery contains a touch of rare Welsh gold extracted from the Clogau St. David’s Gold Mine. The Clogau mine is situated in one of the most stunning parts of Wales – deep in the heart of Snowdonia. Welsh gold is famous for being selected to create generations of Royal Family wedding rings including those of Her Majesty the Queen, the late Diana Princess of Wales, Her Majesty Queen Elizabeth The Queen Mother, Her Highness Princess Margaret Countess of Snowdon, Their Royal Highnesses Prince Charles and The Duchess of Cornwall and most recently, The Duchess of Cambridge. This has made Clogau Gold some of the most sought after jewellery in the world. The mine in Bontddu was opened as a copper mine in 1842 and gold was later discovered by accident in 1854 by the director at the time, Mr. Goodman. Clogau St. David’s Gold Mine has gone through mixed fortunes over the last century; the veins of gold are most inconsistent and difficult to locate, results in its eventual closure. This has made Clogau veins extremely rare. This Clogau Gold jewellery is guaranteed to contain rare Clogau Welsh gold mined from the heart of Snowdonia. 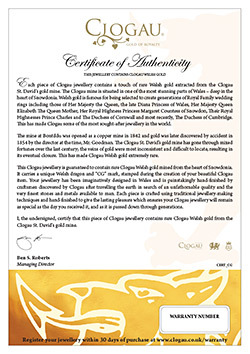 It carries a unique Welsh Dragon and “CG” mark, stamped during the creation of your beautiful Clogau item. Your jewellery has been imaginatively designed in Wales and is painstakingly hand-finished by craftsmen discovered by Clogau after travelling the earth in search of an unfathomable quality and the very finest stones and metals known to man. Each piece is crafted using traditional jewellery-making techniques and painstakingly hand-finished to give the lasting pleasure which ensures your Clogau Gold jewellery will remains as special as the day you received it, as it is passed down through generations.